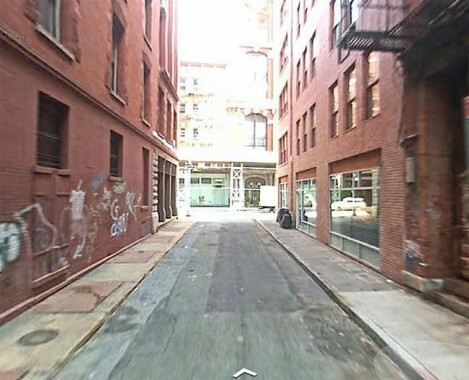 Continuing my recent alley studies, which so far have encompassed Broadway Alley, Jersey Street, Cortlandt Alley and Weehawken Street, I visited one of my favorites, Staple Street, which runs two blocks north between Duane and Harrison Streets, just west of Hudson. Mystery surrounds the name of the street, but rest assured, it has nothing to do with Swingline or Bostitch. 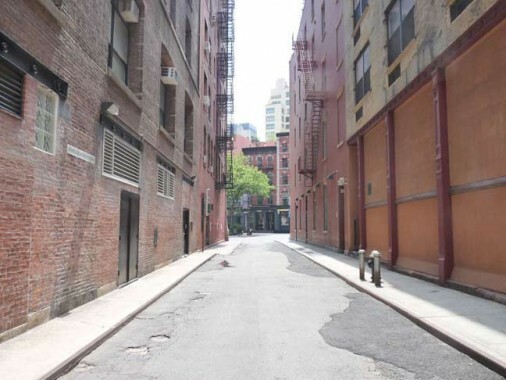 Some sources, such as Henry Moscow in Hagstrom Maps’ The Street Book, say that the name refers to the unloading of goods, or “staples” to the numerous markets that were located in the Lower West Side beginning in the Dutch colonial era. 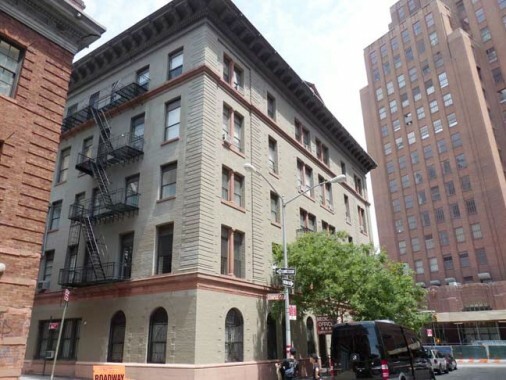 However, the NYC Landmarks Designation Report for Tribeca West disputes that derivation and prefers the explanation that most of the streets in this area refer to political figures, local prominent residents or people associated with Trinity Church, and notes that a John J. Staples owned nearby property around the year 1800. Also, the word may merely be a corruption of the word “stable” and in the colonial era, there were certainly many of those nearby. From Duane Street, Staple Street looks like just a small space between buildings, until you get next to it. 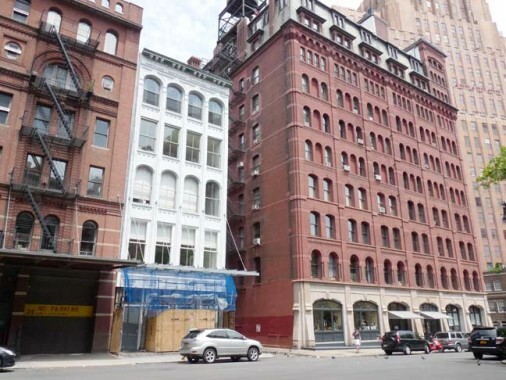 In this case the buildings are 171 Duane Street and the the 10-story brick Schepp Building, designed by Stephen Decatur Hatch in 1880 as a factory, warehouse, and office building. It was named for importer Leopold Schepp, whose most notable product was dried coconut. 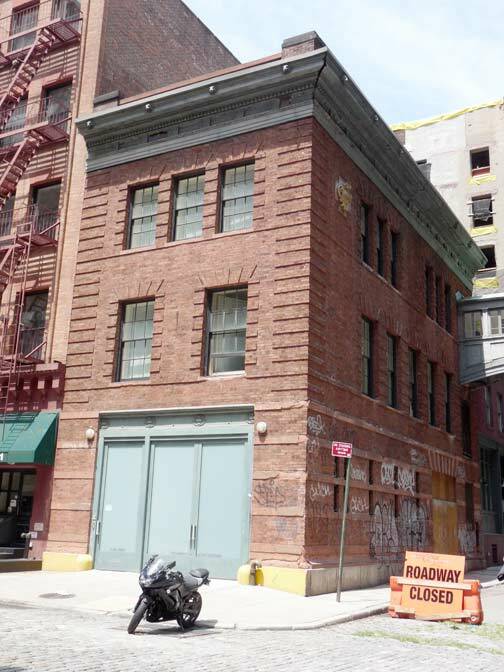 As for 171 Duane, in the very early 19th Century, a one-room schoolhouse occupied the space, but about 1828 a 3-story Federal-style residential building went up in its place that by 1859 had been raised to five stories with the present cast-iron front was appended to the exterior. By the 1880s the building housed coffee and spice wholesalers, and beginning in the 1940s, egg and butter wholesalers M.J. King occupied the ground floor and did so for several decades. This part of town was known as the “butter and egg” district for many years. 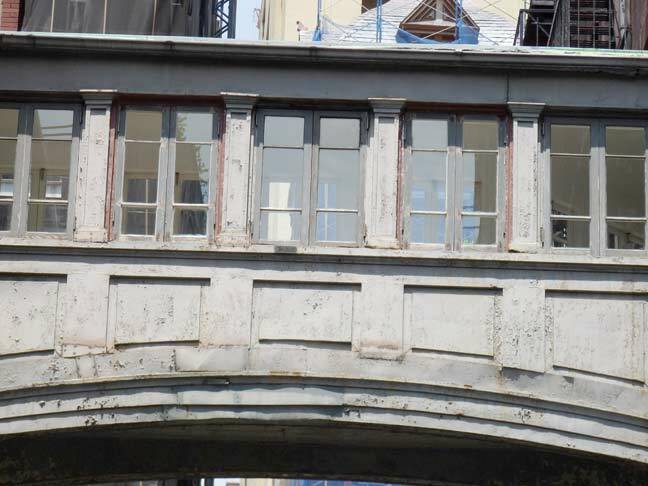 The 19th Century iron shutters that covered the windows on the Staple Street side were recently removed as part of an overall building renovation. This odd item found on Staple Street north of Duane formerly held a “no parking” sign. These bases are often used over vaults, subway vents, or other relatively shallow ground. In this case the “D.T.” probably means the Department of Transportation’s old name, the Department of Traffic. #1 World Trade Center looms balefully over the 1860s-1870s buildings on the south side of Duane Street, as the Twin Towers once did. The lone tower, America’s tallest, is due to open in 2014. To me, the tower looks dystopic, but I’m an old crank. 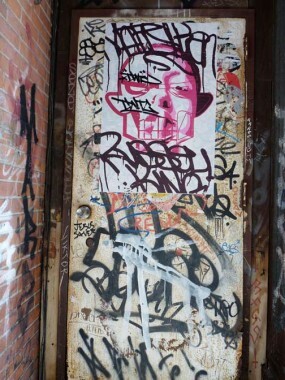 Street art, east side of Staple Street. Note the warning for the vaulted sidewalks referred to earlier. 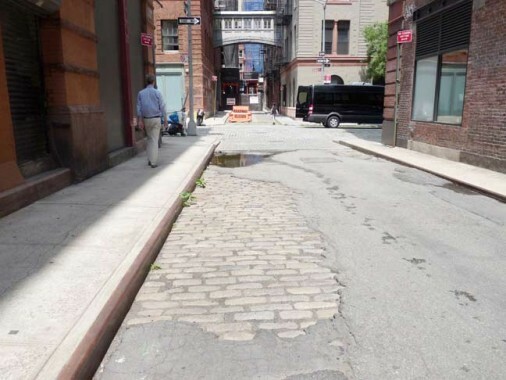 Like most NYC streets, Staple Street was once Belgian-blocked, and indeed, Jay Street, which Staple Street intersects, has been allowed to retain the paving. The sidewalk with the metal edge is relatively new and probably goes back to the 1970s or 1980s. 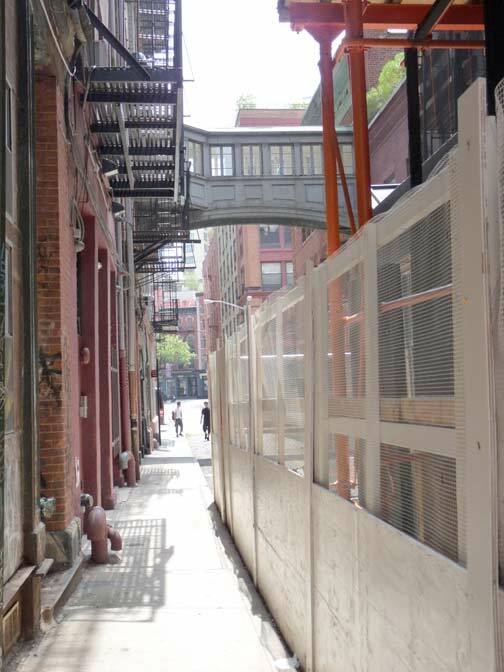 Staple Street has undergone a complete transformation from when it was laid out just after 1800 as a private access lane to stables serving Hudson Street townhouses. The stables and townhouses have all vanished. Looking south from a point between Duane and Jay Streets. 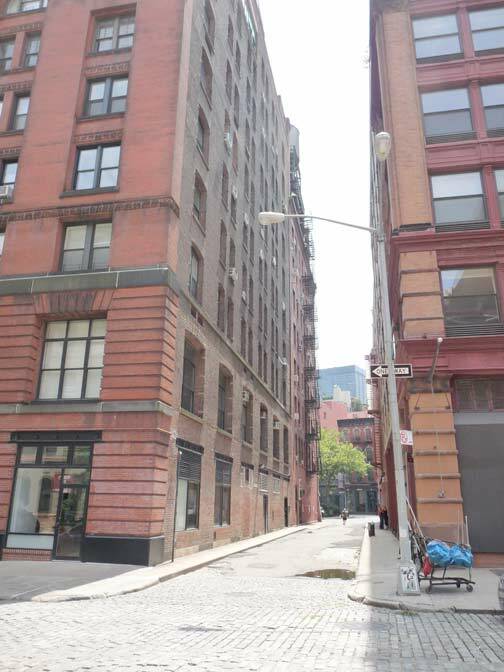 Two buildings on either side of Staple Street at Jay Street were at one time associated with New York Hospital. 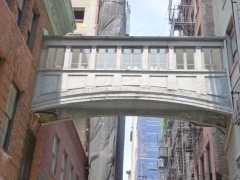 The first, fronting on Hudson with its back facing the east side of Staple, was constructed in 1893 (Josiah Cady, arch.) as the New York Hospital’s House of Relief, or as we say today, emergency room. When the House of Relief was built, NYH was uptown, at 5th Avenue and 15th Street. The hospital had been established in 1771. After a merger in 1998 it became New York-Presbyterian Hospital. 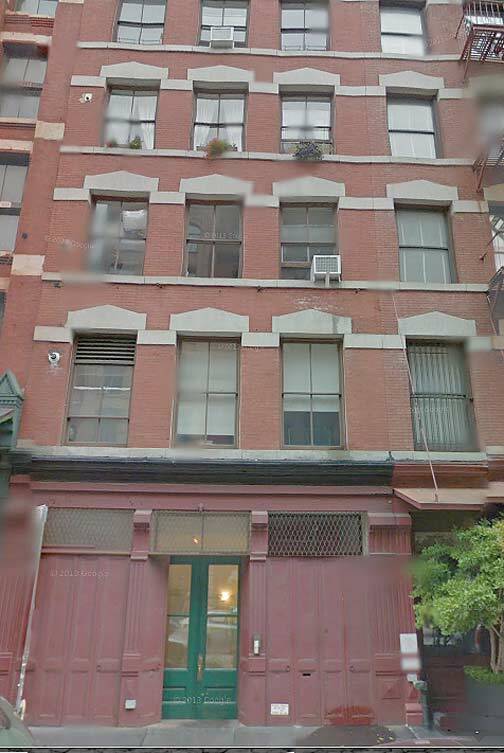 The other NYH building is on the west side of Staple Street at #9 Jay Street. It was built in 1907 as a laundry building and stable serving the House of Relief on the opposite side. 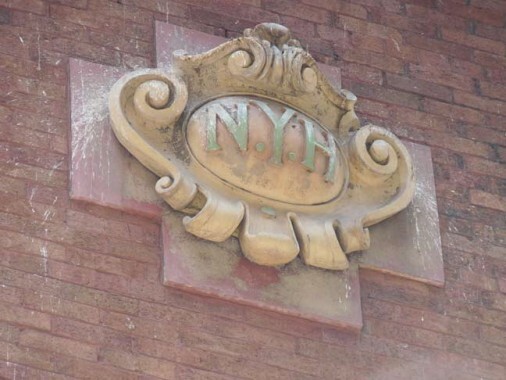 Somehow, a terra cotta shield cartouche bearing the initials N.Y.H. has survived, despite several building renovations over the years. 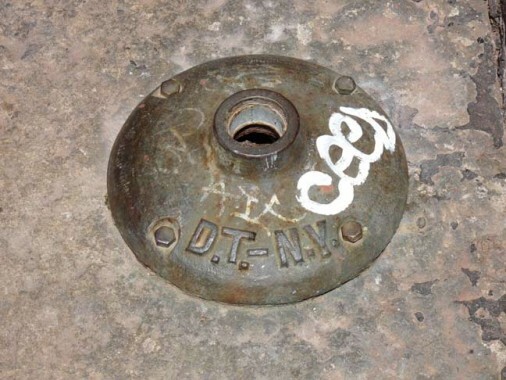 It resembles similar shields found in older NYC subway stations, built in the same decade as this NYH annex, that carry the initial letter of the station stop. Looking south on Staple from Jay Street. 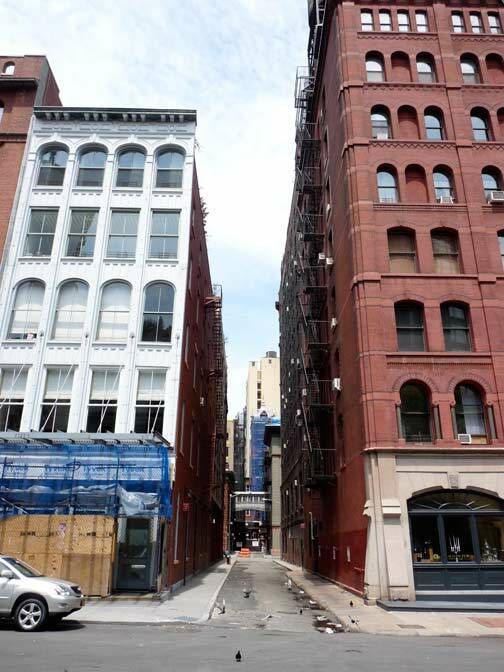 The building on the left, #55-61 Hudson Street, was designed by Edward Hale Kendall for American Express and opened in 1891. American Express, whose original purpose was to facilitate the delivery of goods (much like Fed Ex does today) was founded in Buffalo in 1850 by Henry Wells and William G. Fargo (who founded Wells Fargo two years later) and made its headquarters on Hudson Street. Another American Express Building can be found a few blocks north on Collister Street. And now for the element that has attracted me to Staple Street like a yellow jacket to a picnic for two decades — its bridge. It’s made of cast iron and has picture windows along the sides, and connects the third floors of the House of Relief with the laundry/stables. 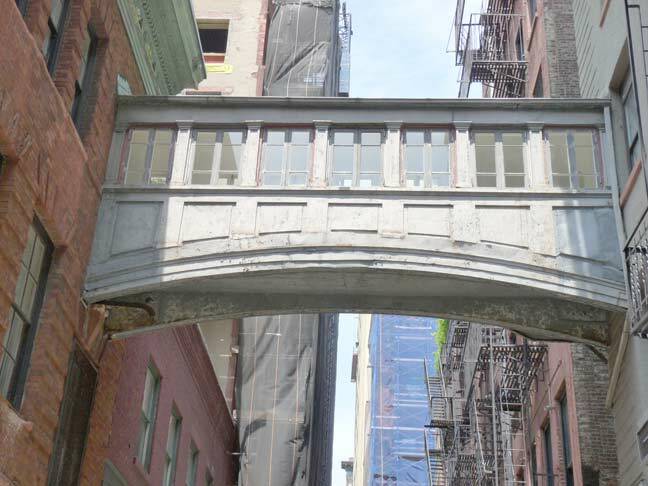 The Landmarks Designation Report states merely that it is a “later addition, designer undetermined” but it can be no older than 1907. 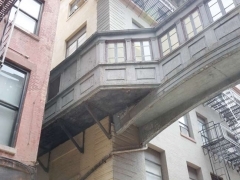 I suppose I’m fascinated with it because while there are many older or more recent pedestrian footbridges connecting buildings around town, they’re usually high above the street, and this one spans one of NYC’s more obscure alleys. 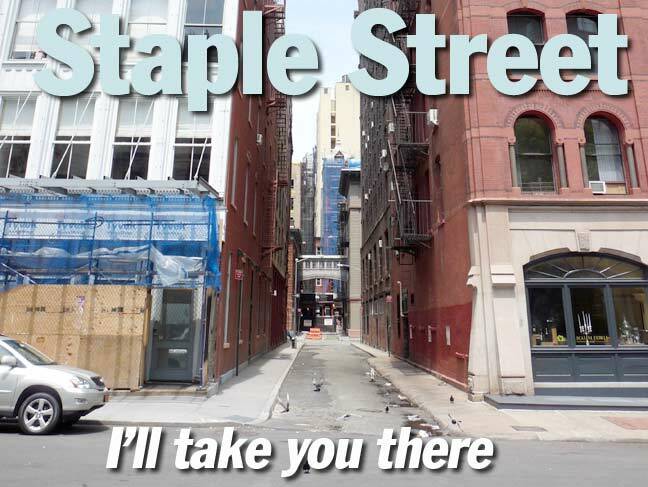 It’s Staple Street’s trademark — its hidden nature has saved it. While both NYH buildings were converted to residential as early as the 1980s, the accessibility of the bridge is a mystery to me. Perhaps some residents have the key to the inevitably locked doors that go to the walkway — if you’re a resident or caretaker who has the key and can let me on, there’s a lunch in it for you. 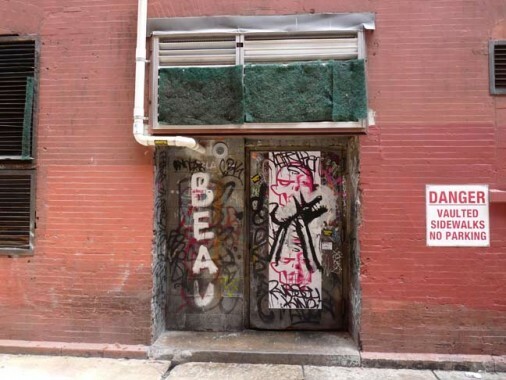 There are a few doorways along the Jay-Harrison section of Staple Street, but most of them are merely the back ends of buildings fronting on Hudson Street. 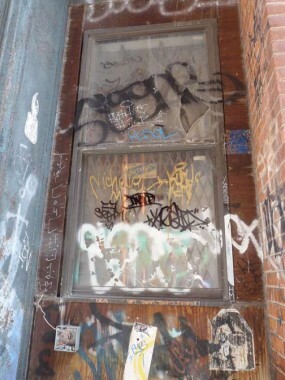 The exception, #4 Staple Street, is the second photo shown here, and the only proper address on the street. According to the LPC Designation report, it’s a wood frame building going back to the early 19th Century; the brick facing was aded in 1868, and the cast iron entrance, which looks recently renovated, about 1900. 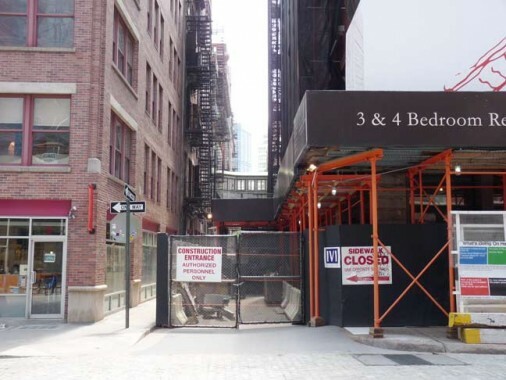 This wasn’t the greatest day to go exploring on Staple Street, since ongoing conversion of #7 Harrison Street into luxury residences had closed off much of the street, except for the sidewalk. 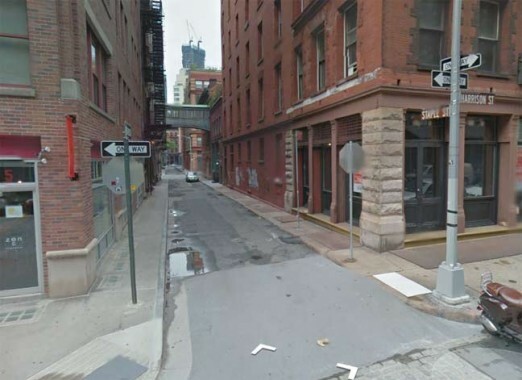 The Google Street View truck has been here, though, and has photographed the north end of Staple Street where it meets Harrison Street. #7 Harrison, in 2013 under redevelopment, is a 7-story masonry building constructed in 1893. It has been used for cold storage as well as dairy and grocery wholesaling. The current redeveloper has a name similar to “Seven Harrison”: Steven Harris. 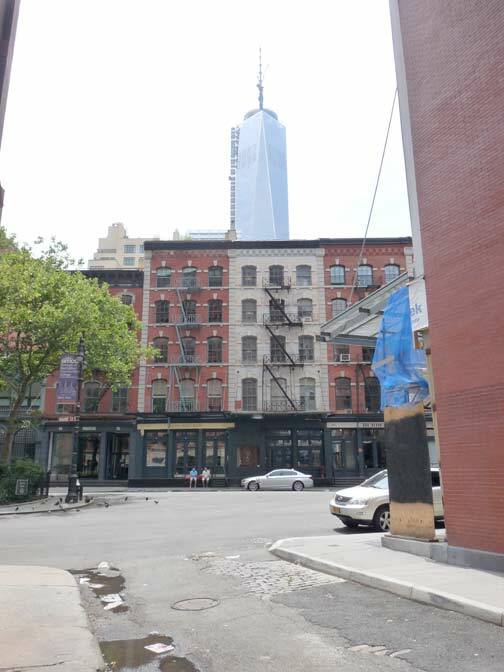 Harrison Street is named either for brewer George Har(r)ison, who had a large complex nearby in the early 19th Century, or Richard Har(r)ison, a vestryman of Trinity Church. The church owned large plots in western Manhattan and when streets were laid out, they were named for prominent figures in church hierarchy. 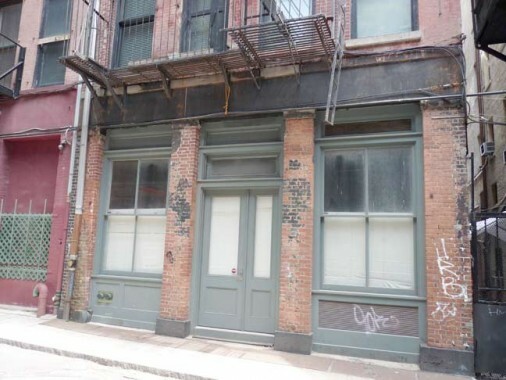 I haven’t seen a building quite like #12 Harrison, near Staple Street — it has a group of cast-iron shutters covering what I presume to be windows on the ground floor. 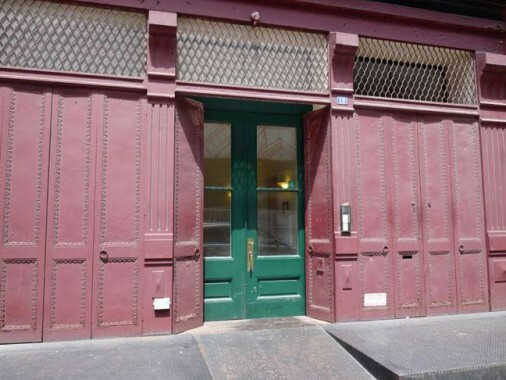 It was built in 1885 and formerly home to canned goods and dried fruit wholesalers. 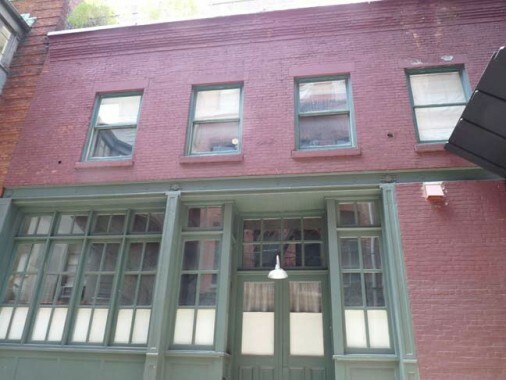 Sources: NYC Landmarks Designation Report for Tribeca West; Cast-Iron Architecture in New York, Margot Gayle and Edmund V. Gillon, Jr.
Back in the 1980s and 90s I used to deliver heating to 7 Harrison St. The fill for the oil tank was on Staple St. ,about the middle of the block. I spent many a cold winters day on that block making my delivery. Occasionally a tenant from across the street would open their window and complain about the truck noise and exhaust smoke, but I was able to placate them with sweet talk. On a note about the bridge,I never once in 20 years saw anyone walk thru there. It certainly was not named for the office-supply retailer, either. Bet on that! 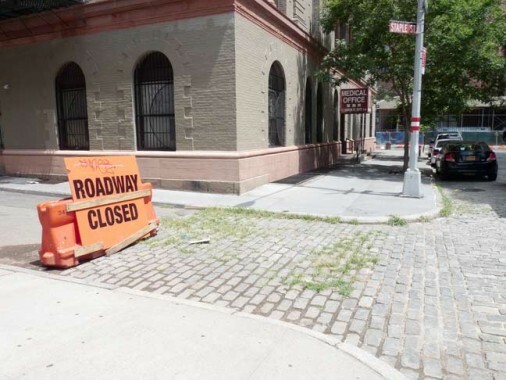 But just as with every other part of Manhattan, it would not surprise me if one day a Staple’s (or some other chain store retailer) wanted to move in, and the immediate neighbors cried bloody murder. In 1980, I worked in the Schepp Building for a very famous movie director. I spent some time in that tower shown in the upper right corner of the second photo. Across the little triangle, a couple of the butter and egg wholesalers were still hanging on. I remember that movie director. I saw him a few times coming out of a black limo with a white poodle, which always surprised me, considering the movies he directed. That period was fun. 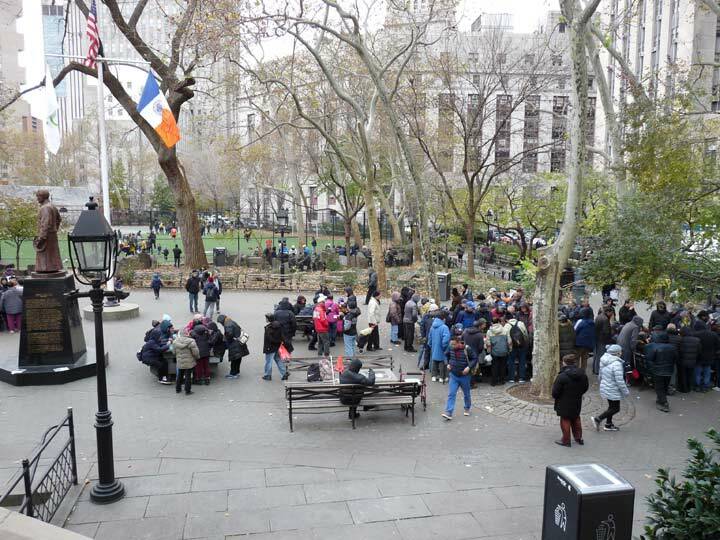 In one day you could meet the director and the main actors of his iconic movie, in the few places in TriBeCa where you had people congregating. the converted townhouse on Staple is owned by architect Diana Kellogg. There are many beautiful photos of the interior her website. 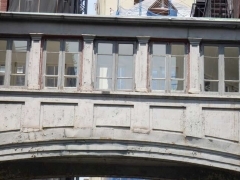 After 40 years in NYC, just hours ago today did I wondrously stumble upon the bridge on a street with no signage (at least on north end) …which I only now, after Google search, have learned is named Staple. That is an amazing piece of history! Thanks for sharing it with us!